Turn your Apple into the world’s most versatile personal computer. The Softcard™ Solution. Softcard turns your Apple into two computers. A Z-80 and a 6502. By adding a Z-80 microprocessor and CP/M to your Apple, Softcard turns your Apple into a CP/M based machine. That means you can access the single largest body of microcomputer software in existence. Two computers in one. And, the advantages of both. Plug and go. The Softcard system starts with a Z-80 based circuit card. Just plug it into any slot (except 0) of your Apple. No modifications required. Softcard supports most of your Apple peripherals, and, in 6502-mode, your Apple is still your Apple. CP/M for your Apple. You get CP/M on disk with the Softcard package. It’s a powerful and simple-to-use operating system. It supports more software than any other microcomputer operating system. And that’s the key to the versatility of the SoftCard/Apple. BASIC included. A powerful tool, BASIC-80 is included in the Softcard package. Running under CP/M, ANSI Standard BASIC-80 is the most powerful microcomputer BASIC available. It includes extensive disk I/O statements, error trapping, integer variables, 16-digit precision, extensive EDIT commands and string functions, high and low-res Apple graphics, PRINT USING, CHAIN and COMMON, plus many additional commands. And, it’s a BASIC you can compile with Microsoft’s BASIC Compiler. More languages. With Softcard and CP/M, you can add Microsoft’s ANSI Standard COBOL, and FORTRAN, or Basic Compiler and Assembly Language Development System. All, more powerful tools for your Apple. Seeing is believing. See the Softcard in operation at your Microsoft or Apple dealer. We think you’ll agree that the Softcard turns your Apple into the world’s most versatile personal computer. Complete information? It’s at your dealer’s now. Or, we’ll send it to you and include a dealer list. Write us. Call us. Or, circle the reader service card number below. Softcard is a trademark of Microsoft. Apple II and Apple II Plus are registered trademarks of Apple Computer. Z-80 is a registered trademark of Zilog, Inc. CP/M is a registered trademark of Digital Research, Inc. I remember this ad too! I wonder how well the card really worked in the Apple II? I’ve used similar cards (not sure if they were the Microsoft version or not) on the //e and it made a perfectly workable CP/M system (in this case used mainly for WordStar). 80 columns and lowercase of course helped a lot here. 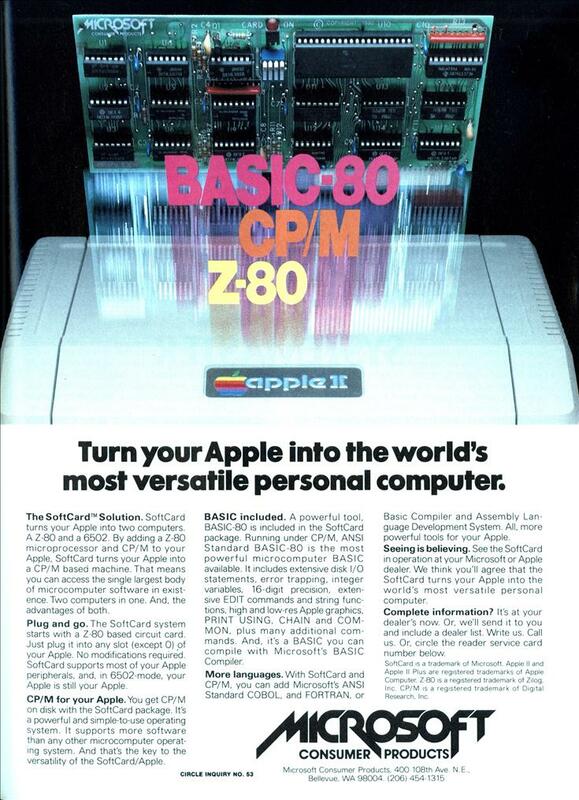 I think at one point Apple II’s of various sorts were the most popular CP/M systems made–rather impressive, since you could only get there with a third-party card. The Softcard worked quite well. Drivers were run on the 6502 side, especially because it was impossible to operate the floppy controller with anything but a 6502. (Woz’ design relied on certain memory-fetch behavior of the 6502.) The Apple ][ provided power and all I/O. If you wanted 80-column video, that took another card. 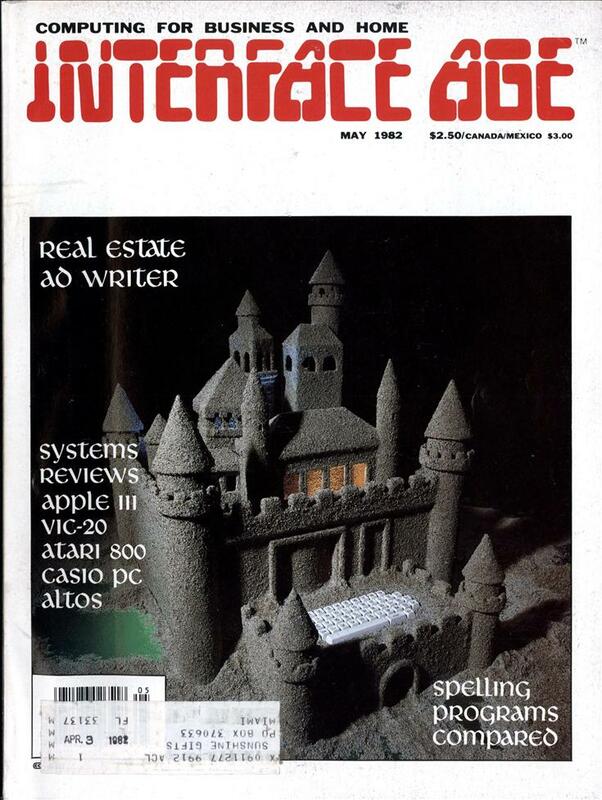 @Rick Auricchio: I think I have one of those SmarTerm cards (not sure which version) lying around somewhere in my Apple collection; unfortunately, I only have a IIgs – I’m not sure if it would work in one or not…heh. @Rick Auricchio: I’ll look for that; my IIgs systems both “came with” (well, at least how I found them next to the dumpster I rescued them from!) 80 col cards, but I don’t think they were Smarterm cards. I do know that the slots are the same; I just don’t know if there is anything special about the IIgs in its other hardware or ROM code that would prevent an older card for the IIe from working (although, supposedly, that was a selling point of the IIgs – backwards compatibility). Thanks for the tip! Installed that package on my A-II+. You needed an 80-column screen to us CP/M. Paid about $500 for the second floppy disk drive. I love the geekiness of the ad. “Just plug it into any slot (except 0)” That level of technical detail never makes it into marketing material today.